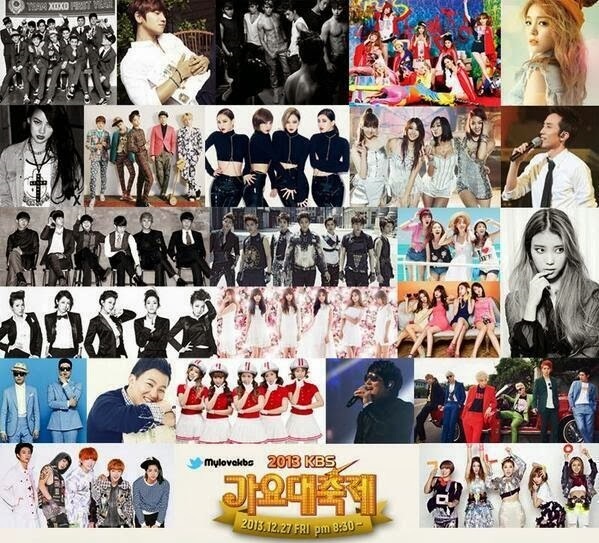 It’s Gayo season around these parts, the time of the year when the big three broadcast companies put on their end of the year shows, highlighting popular acts throughout the year and sometimes putting on special performances. These are long sets, usually taking around three or four hours for the full program. Below are the three programs with times, attendees, and news about special stages. The program is operating on the ‘Music Makes Miracles’ theme. 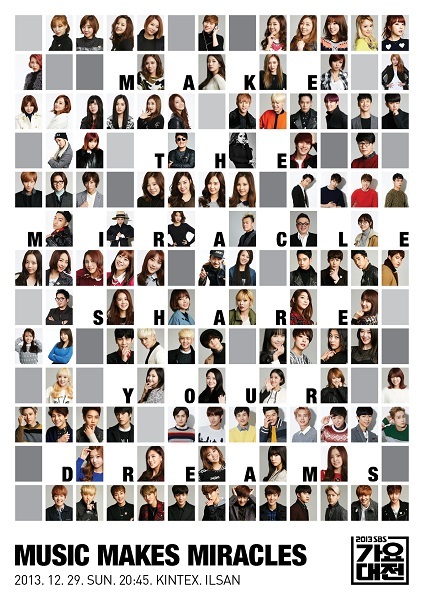 Before broadcast, 125 idols and singers got together to sing the song “You Are a Miracle” for a music video. The song will be performed live and all proceeds from the song and music video will be donated to charities via SBS. List of Attendees: Dal Shabet, Ladies’ Code, Rainbow, Park Hyun-bin, BTS, Block B, Sul Woon-do, Girls’ Generation, Son Jin-young, Park Soo-jin, Han Dong-geun, IU, After School, Ailee, Lee Juk, Lee Hyori, Insooni, Infinite, Lim Chang-jung, K. Will, Crayon Pop, Tiger JK, Yoon Mi-rae, Bizzy, Tae Jin-ah, 4minute, Hong Jin-young, 2pm, A Pink, B.A.P, B1A4, Beast, BtoB, CNBlue, Exo, f(x), Girl’s Day, Kara, miss A, Secret, Shinee, Sistar, T-ara, Teen Top, VIXX, and ZE:A. Typically, participants are separated into Blue and White teams. Groups go head-to-head with their performances and fans can vote via SMS. At the end of the program, one of the teams is deemed the winner by votes. The stages listed are the ones that have been announced, but there could always be changes or additions by the time the actual show airs. The list of attendees look promising, but is there a special program you’re looking forward to checking out?